What drives you? Is it the thrill of the open road? Or simply the need to get your family home safely? Either way, a Mazda may be the perfect solution for you. With elegant styling, surprising performance, and handling that knows no equal, you will feel right at home in a Mazda. Models like the Mazda CX-5, Mazda CX-9, Mazda3, and Mazda6 put the experience of the driver first, and you can try all these Mazda models and more right here at Cardenas Mazda. 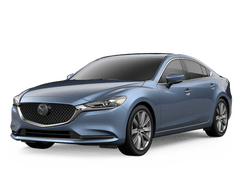 Not only do we have a wonderful new Mazda inventory, we also have an extensive used inventory that includes a variety of brands and models. Looking for Mazda service? We can take care of that too! Come to see Cardenas Mazda today. The Cardenas name has been doing business in South Texas since 1960, and we will happily get to work for you right here in Harlingen where we serve all the surrounding areas including Pharr, McAllen, Mission, Edinburg, Brownsville, San Benito, Mercedes and many more. Stop by and see us today!